Heat oven to 375°F. Lightly spray cookie sheet with cooking spray. Unroll dough into 2 long rectangles; press perforations to seal. Cut each rectangle into 12 squares. Place squares on cookie sheet. Top each square with 1/4 teaspoon sweet-and-sour sauce. Layer each square with cheese, ham, more cheese and the pineapple. Bake 11 to 12 minutes or until edges are golden brown. Serve warm. Store in refrigerator. Garnish the platter with small leaves from a fresh pineapple. 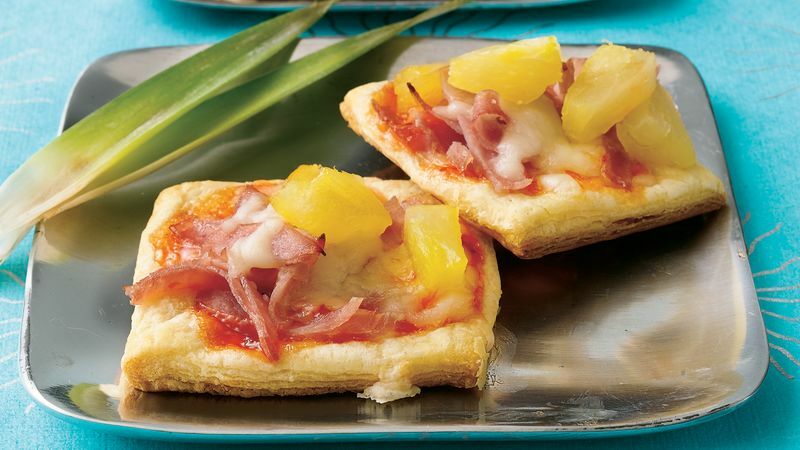 Assemble these tiny pizzas ahead; cover and refrigerate them for up to 2 hours before baking.